My squad hits the dirt behind the fanned trunk of a giant kapok tree when a Mamba .511 starts bark-bark-barking from somewhere in the jungle. The kapok’s splayed base eats up the rounds better than armour, but the wood’s not hard enough for long term comfort. “Poachers!” yells Ortez, stating the obvious. What are you gonna do? Kid’s a rookie. “Roger that,” says Lerner, the Austrian with the Masters in Comparative Theology and Bowie face tatts. He’s been spoiling for a fight for days; I can practically hear him grinning. A static hum fills the hollow at the foot of the kapok as our exo-skirmishwear powers up. I’m in the Villeras-Cristos Gigantic, with the static discharge plates and short-range spring boosters; the rest are rocking standard-issue armoured suits with ballistic compensators, muscle enhancement and skeletal reinforcement, all wrapped in bespoke Amazonian-camo skin with subtle corporate logos. We look like six of the roughest, meanest tropical beetles you’ve ever laid eyes on. Tannie and Bron Chisholm bound left on enhanced leg musculature, their forearm-mounted submachineguns chattering a retort back at the poachers. Ortez and Reed slink right into the low underbrush, camouflage filters dropping their contrast to match the rainforest shadow. They’re jacking themselves with a cocktail of sensory and reflex boosters, as well as neutralising agents to calm the edge off Ortez’s adrenaline spike. The shooting cuts out as our attackers lose line of sight on their targets. I direct hand signals at Lerner; I want intel. He drops an infoslim between us and calls up a map, pointing out our position. Our patrol range covers several hundred hectares of mountains, valleys and river networks covered in some of the densest foliage on Earth. We don’t always know where we are, at least not without checking. Decades of military combat experience, state of the art mobile frames, combination arms ranging from tranquilisers to ground-to-air missiles, and an unpredictable beat? Usually, it’s enough to discourage poachers, but not always. The moment of silence stretches out to thirty seconds, which means the poachers are either prepping another ambush or pulling an orderly retreat. Since their first sucker punch missed its mark, I decide to assume they are, excuse me, bugging out. Unfortunately, their best line of retreat from our current position is down the valley to our west. Directly toward the Romanian bug research encampment. I access detailed aerial surveillance data showing the disposition of the Romanian facility: the glasshouse-domed field laboratory, the stock pens, the sonic fencing systems. Assuming the poachers were on foot, in good health but not enhanced, I figured they could hoof it down to the sonics in about ninety seconds. Still in our fire teams of two, we cut loose and hit a run, trying to get ahead of the poachers. The beetle suits can scuttle up to 80 kays over short distances. Trouble is, at that pace they shed a lot of manoeuvrability. Way we figured it later, Ortez crashed into the middle of the squad of poachers like a stolen cab through a shop window. He caught a ricochet off his own chest plate when they panic-fired at him. The round went up under his chin. Not a lot of ballistic mesh in that spot. “Contact!” Reed tells us with his customary understatement. He’s carrying the heavy load, a sleek HammerJack 7.56mm machine gun on gyroscopic mountings. It slows him down a touch, so he was a few steps behind Ortez. It gives him a front seat for the chaos. The poachers either sent in an advance party to disable the sonic barriers, or they have a man on the inside. Safest bet is to assume it’s the latter. Research assistants are never paid what they’re worth, except by organised crims looking for a low-stress score. With the sonics down, the herd is free to wander. I burst out of the undergrowth just in time to see a large set of mandibles snip the poachers’ point man almost in half. It’s the size and roughly the shape of a VW Bug with an enormous claw attached to the front, and it’s not alone. The beetles burst from their grassy enclosure, spilling out in a green-black tide of hard shells and take-no-prisoners attitudes. Another tries the same trick on Reed’s reinforced suit, less successfully. The poachers, who have guns, grenades and diamond-edged carapace-harvesting chainsaws, are no match for the beetle stampede. Knocked down or run through, they’re easy prey for our targeting systems. 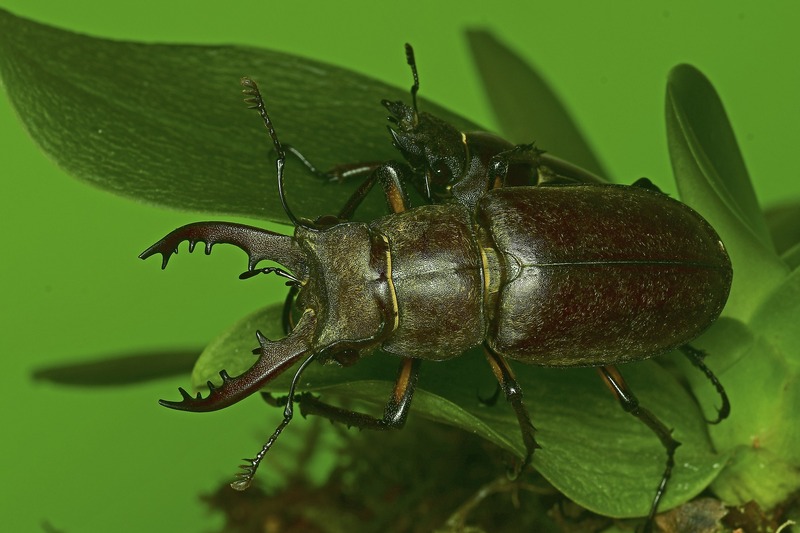 Plus-sized Lucanidae – stag beetles – engineered and reared by the Romanian mad scientists for – something. Organ harvesting, probably, or maybe their shells can be ground down for cheap industrial sealant. Whatever. There’s about fifty such wild genetic experiments going on inside our patrol zone, each weirder and less legal than the last. I’ve never asked. We all trigger a scent package which permeates the fibrous underlayers of our suits. The scent is undetectable to humans, but the bugs are repelled by it. We encircle them like sheepdogs. The stampede ends as quickly as it began, as the Lucanidae turn away from us and scuttle back toward their enclosure. They leave a pulped mass of bodies and poaching gear in their wake. I have a weird job. Honestly, I have no idea where this one came from. I do like cool power armour, but the genetic tampering to farm gigantic beetles in the Amazon? I don’t know. I have a weird job. This entry was posted in Friday flash fiction and tagged carapace, flash fiction, Friday flash, insect, mecha, military, science fiction. Bookmark the permalink.